This listing includes the original game CD. An on-screen, printable manual is also included. The boxes are pictured for reference only and are not included. I will also provide a compatibility CD that will allow the games to run under ALL VERSIONS of Windows 10, 8, 7, Vista and XP, both 32 and 64 bit. Multiplayer Death Match works fine, though a simple game config file update (which I will provide) is needed on your machines. One step: Insert my CD and the games will automatically work on your computer. Done. Yes, it's that simple. Want to play? Click the icon. Want the games off your computer? Click Uninstall. Zero hassle. The world has been attacked by the three Serpent Riders from the Abyss. Their mysterious power makes people obey and follow them like sheep. Only the ancient Sidhe elves are immune to the Riders' influence, which led to them being branded heretics. With most of their work done, the two elder Riders leave, leaving only D'Sparil, the youngest and weakest Rider, behind to oversee the oppression. He sends the armies of the Seven Kings against the Sidhe, who have no choice but to extinguish the Seven Candles, vanquishing the armies. The retribution is swift and hard, and most of the elves are destroyed. Now, one of the last remaining Sidhe must take the fight to D'Sparil himself, being the only hope his world has left. 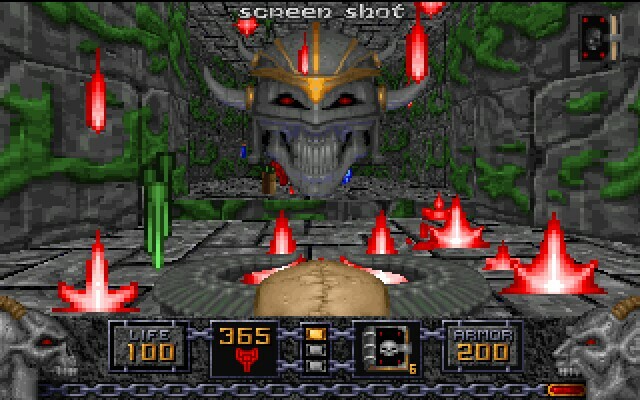 Like Doom, Heretic consists of three distinct episodes, playable in any order, the first being available as shareware. The hunt for D'Sparil begins in the City of the Damned, continues in the alternate dimension of the Hell's Maw and comes to an end in The Dome of D'Sparil. Every episode consists of nine levels, one of them a hidden one. The goal in each level is to find the exit, killing everything standing in one's way. Keys must be found and buttons pressed to advance. Enemies include gargoyles, golems, undead knights, sorcerers, ophidian beasts and more. Most enemies exist in several varieties: some have additional range attacks, others have ghost forms and are impervious to certain weapons. The weapon arsenal is large and varied: the basic weapons are a wooden staff and the Elvenwand that shoots low-damage magic bullets. More powerful equipment must be found: the Ethereal Crossbow dispenses a spread of arrows doing high damage, but at a low firing rate. The Dragon's Claw and Hellstaff shoot with a higher frequency: the Claw hits enemies instantly, the Staff's energy bullets need to travel to them first. The Phoenix Rod fires explosive charges and must be handled with care. The Firemace unleashes steel metal projectiles that bounce across the room towards the enemy. 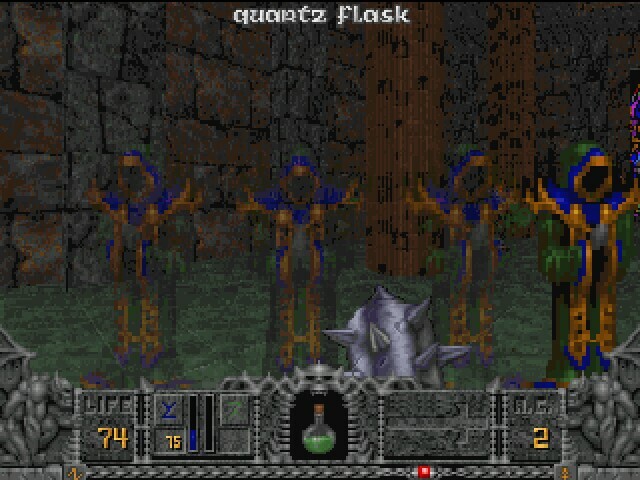 A better melee weapon than the wooden staff are the Gauntlets of the Necromancer, which dispense deadly energy. Heretic goes beyond Doom in certain aspects. The engine was enhanced with the ability to look up and down and the ability to fly, and wind currents pushing the player in (often unwanted) directions have been added. Many different power-ups can be collected and then be used at the correct time. These include health flasks, invisibility and invincibility upgrades, time bombs, and torches to light dark rooms. The Morph Ovum transforms enemies into chickens for easier dispatching, the Wings of Wrath allow one to fly, and the Tome of Power gives all weapons a substantial upgrade: projectiles become more powerful or split up upon impact; the Phoenix Rod becomes a flamethrower and the Gauntlets remove life force from an enemy and transfer it to the player. 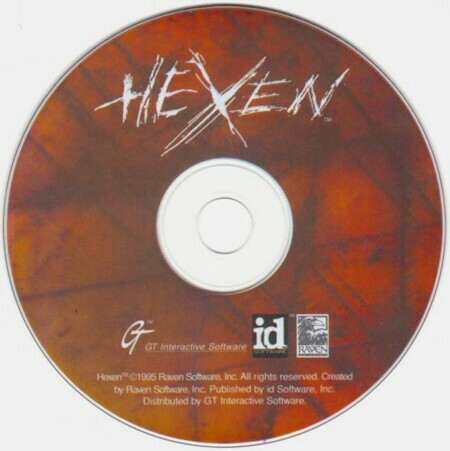 Depending upon how you like your brutality, Hexen may appeal to you more than Doom. First, a lot more of the fighting, especially for non-mage characters, is close-in, and involves devices such as maces, axes, hammers and other notoriously undainty implements of personal violence. Second, the sounds resulting from the employment of said implements are a lot nastier. (Wetter, if I must be perfectly clear on this point.) The ability to choose between heroes of slightly differing abilities (strength, armor and magic, for instance) ultimately adds to the replay value of the game, and gives more of an edge to Death Match games. Respawning foes make life a bit more hectic, especially when you're going back looking for something you missed or failed to understand the first time. You'll be doing a lot of that--the game levels are designed in “hubs” of environment through which you find yourself re-circulating, rather than in the linear "level" scheme of Doom. Nice visual touches like swirling leaves, scattering bats, and non-critical ambient animations make the dark, 3-D fantasy locales more compelling and realistic, even if you're still wandering around mystical ruins and slaughtering murderous grunting things. Accessible audio track selection controls allow the carnage to take place to the game's adequate soundtrack or to the noise of your choice. Slicker, smarter and more stylish than Doom---with all the killing and three times the replay value.